My wife was talking to our girls about names. We don’t want our kids to call us by our names or anything, but it might be handy if we ever got separated and some authority figure asked them for the information. “Do you know what Mommy’s name is?”asked my wife. “Is it ‘Mommy’?”asked my oldest daughter. “Do you know what Daddy’s name is?” asked my wife. “Is it ‘Daddy'”?” asked my daughter. “Is it ‘Handsome’?” she asked. 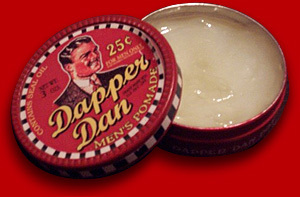 This snapshot of life in the Mosey household is brought to you by Dapper Dan Men’s Pomade. ← Saturday Photo Prompt | No More Beans. So cute. Make sure thy know your number too. Better yet give them a business card to keep in their pocket in case you’re ever separated.